This book is based on documents and materials from the State Archives of the Russian Federation, the Tyumen and Tobolsk Archives as well as the Tobolsk, Tyumen and Verkhoturye Local History Museums to whose staff the author expresses his deep gratitude. A lot is written about Grigori Rasputin but for the first time the Russian scientist and publicist Oleg Platonov analyzes these �works� which often turn out to be mere fabrications. With documentary evidence the author proves that the image of Rasputin as an almighty favorite was created by the powers destroying Russia and the tsarist regime. The real Rasputin and his fabricated image had nothing in common. Recreating the true personality of Grigori Rasputin is important nowadays due to the fact that the Russian Orthodox Church is discussing canonizing the Tsar�s family and Rasputin was their close friend. Even a professional historian may find it difficult to discover the truth among lies and libel, falsifications and evil mockery considered true by contemporaries in the early twentieth century and handed down to the next generations. To get to the essence of this political phenomenon one needs more than just facts and logic although they are an essential part of the historical equation. Complete understanding requires discovering the psychological reasons underlying the mass psychosis which was purposefully brought among the Russian people for two decades. The main purpose of the anti-government powers was to destroy the monarchy and overthrow the Tsar and nothing was spared to achieve that goal. Adhering to the gospel testament to know the tree by its fruit, we now see the fruit of those times: destruction of the country, family and morals, on the one hand, and holiness and wisdom, on the other hand, which is now ethereal. These results should be used to judge who was right and who was wrong in that tragic pre-revolutionary struggle. Nowadays many people think about the Russia �we have lost� and grieve over what we now have. Our late insight should not lead us to the other extreme to where we see the past only with rose-colored glasses. Yes, Russia had its weaknesses but it did not prevent our forefathers from living, developing, creating and most importantly �keeping their orthodox faith which showed them the right way. We have lost all that and now regret it deeply. In our sincere repentance we make incredible attempts to restore the truth and preserve the orthodox values. For a long time the last Russian Tsar was labeled �bloody� though his accusers did not conceal that they had shed much more blood including the blood of the Tsar, Tsarina and their innocent children. We firmly believe that the Tsar was a near saint and though aspersion is still cast on him, it happens less and less often now with fewer and fewer supporters. Nowadays there is no need to defend those whose dignity was proven while ruling the country and after that, in exile when facing his tormentors. Another question is Rasputin�s personality still entangled with lies, libel and doubtful half-truth. Anything said in favor of G.E.Rasputin-Novykh is taken with mockery. �Are you crazy?� many ask. �He was a debauchee and drunkard� His name speaks for itself!� �How do you know that?�. �This is a well-known fact!� you�ll get as an answer. Meanwhile the truth is not known to everyone. It is easy to create an image of a historic personality on the basis of rumors and gossip but such an approach is unscientific and dishonest. Would just a drunkard and debauchee have had such an influence on the Russian history? Of course not. He would not have caused a wild torrent of libel and hatred from the enemies of the monarchy as such Rasputin would have benefited them. In fact Grigori Efimovich Rasputin-Novuy was an extraordinary person and a holy man. Maybe some readers will smile skeptically at that claim. Well, the only thing to say here – he who laughs last, laughs best! Those who seek the truth first always have it hard. They face distrust and contempt. They are looked upon as useless amateurs when in fact their courage should be applauded. The author of this book quotes many convincing undeniable facts. Of course, there may be opponents with their own imaginary or falsely interpreted facts which fall within the usual standards. �No axe can cut out what a pen has written about�, they will say. In response we can ask – what pen? If it is written by a devilish pen, we cannot trust these words. And Oleg Platonov didn�t. His search for the truth was sincere and impartial. Let the God help him! If you have read his books about Rasputin, you know how well-written they are though sometimes you stop and think that the author�s concept is too different from anything we have heard and read about Rasputin. Well, we live in an age of skepticism and doubt. These times are good for those seeking the truth. Oleg Anatolievich Platonov started his research as he doubted the existing stereotypes about Rasputin. Only doubt for the sake of doubt is negative and useless. It is similar to arrogance and reminds us of the recent mass atheism when the God was being mocked at. People did not acknowledge his existence thus contradicting themselves. As a result there was foolishness and madness – involuntary confirmation through negation. Any time we are in doubt the evil spirit tries to channel such doubt for its benefit. Generally people have doubts about the most important and vital things. They do not doubt those secondary things preventing us from seeing the forest for the trees. We must look ahead and our faith will help us. Liars, destructionists and passive skeptics are seldom able to believe just like children do. To believe in the person who worried about Russia with all his heart, suffered for it, shared its tragedies with his people and who showed compassion both to the Tsar and just simple people. Not surprisingly the Tsar�s family was very devoted to Rasputin. Good hearts know each other. They felt that Rasputin was a holy man and treated him like one. He helped them with prayers when reputable doctors were helpless. I mean the Tsarevich�s healing. Now they are trying to explain his healing otherwise as they are many alleged healers nowadays. However there have been many cases when their healing unsupported by the orthodox faith brought only harm. Rasputin was orthodox and called for everyone to share his faith. I was deeply impressed by the fact that after being shot and thrown into ice-cold water he had his fingers in a sign of the cross. The cross stands for victory over demons. Rasputin for me represents the entire Russian people – shot and defeated he still kept his faith even when dying and thus he was the real victor! Another thing that surprised me about Rasputin was his religious essays. They could be written only by a person with an intense spiritual life. Let the God be with you, Oleg Anatolievich, for not being afraid of public opinion and bravely revealing the truth about the Tsar and Rasputin thus revealing the truth about the whole Russian nation. Let us put aside our skepticism, read and believe in the book by Oleg Platonov. Let the Christ save him. There is truly no one more talented than a Russian muzhik. What an original interesting personality! Rasputin is an honest and kind person always willing to do good and eagerly giving his money away to those who need it. My idea to research the life of Grigori Efimovich Rasputin resulted from the many years I spent studying the life of the last Russian Tsar and his family. The more documents, dairies and correspondence I read, the more surprised I was at Rasputin�s image as an arm of the devil, an immoral and selfish person, whose stereotype has been reinforced for decades. Till the very last minute the Tsar�s couple believed in Grigori Rasputin�s prayers. They wrote from Tobolsk to Anna Vurybova, the Tsarina�s friend, that Russia was paying for Rasputin�s murder. No one could shake their trust in him though they read all the hostile newspaper articles about Rasputin which were brought to the Tsar�s family and everyone tried to convince them that Rasputin was a bad person. We should not be under the impression that the Tsar and Tsarina were naive people easy to deceive. Due to their position they had to do multiple checks on Rasputin to confirm the information they received (we will talk about that later) and each time they found out that everything said against Rasputin was gossip and libel. I used to think that so much was written about Rasputin that there was nothing left about him that we did not know. Indeed a lot of books, brochures and articles on Rasputin were published primarily in the 1920�s. When I started reading attentively trying to find the primary sources for various facts, I found myself in a vicious circle. Most publications had the same examples. The authors considered them true evidence and did not think it necessary to include references to primary sources. I decided to verify this information by archival data and study Rasputin�s personal archives and other materials related to him. I discovered some interesting facts. No serious research on Rasputin was done in the Soviet times. There is not a single article (to say nothing of books) where Rasputin�s life is described consistently, historically, on the basis of critical analysis of primary sources. 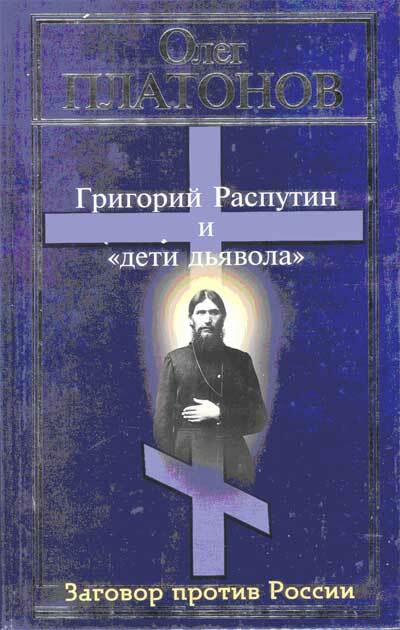 All existing books and articles about Rasputin simply repeat in various combinations the same historic legends and anecdotes (with the revolutionary accusations), most of which are made up or fabricated just as false memoirs by Vyrubova or shorthand reports of proceedings against �enemies of the people� from the 1930�s. In fact they created a myth about Rasputin with the only purpose being to blacken and discredit Russia, the spirituality of its people which, as we will see later, Rasputin represented to a certain extent. And �this incredible rage coming from the pages of the yellow press targeted against Rasputin completely gave away those devilish firemen which were capable of getting what they wanted only by enormous and all-around heat�. The myths about Rasputin were distinctively anti-Russian and were created by the so-called left radical, revolutionary movement for which any dirty, deceitful and bloody methods were acceptable. However we see that the Russian public understood those goals of the myth creators even when Rasputin was alive. In the newspaper polemics of those years some described Rasputin as a holy person and pilgrim, others – as a dreadful debauchee and drunkard. The newspapers primarily published negative articles about Rasputin not supported by any facts. In a wild and ever increasing flow of such information attempts to reveal the truth remained unnoticed. The left radical press used their power to bring about wild hatred against Rasputin in the Russian people. The right movements also attacked Rasputin. Some critics were truly sincere but there were a lot of those who furthered their career through their criticisms of Rasputin. �Here is our civil courage! We are not afraid even of Rasputin! Praise us, admire our courage, make us more popular�. The left-wing papers were eagerly praising such people and that was exactly what they needed. Our society believed in the myths about Rasputin�. Such belief is still here as those people (actually their immediate heirs) who created those myths and are interested in their survival are still alive and prospering. The myths about Rasputin may be seen as a specially created obstacle (though not the only one) on the way to understanding our spiritual, political and national values. They were created to block the return to those values so that people looked at Rasputin�s image and veered away from their past in terror trying to forget it and never go back. It is time to remove these and other obstacles. This can be done only with attentive and impassionate research of the true facts and documents as well as careful analysis and comparison of various sources strictly following the historic line of events. This is the only way to unravel the tragic story of Grigori Rasputin�s life and death. Many documents and other materials quoted in this book are published for the first time. They come primarily from the archives and museums where they have been kept under special surveillance for many decades. These are documents and materials from Rasputin�s personal archives stored in the State Archives of the Russian Federation – 52 volumes. The State Archives also have the diaries of surveillance after Rasputin from 1912 to 1916 where his meetings are reported. The Tobolsk and Tuymen Archives have a number of case files in particular a case concerning Rasputin belonging to the Khlysty sect, a case about an assassination attempt and numerous files of observation for Rasputin by the Tobolsk police department and Tobolsk consistory. Moreover the book also contains the results of interviews with 40 residents of the Pokrovskoye Selo where Rasputin was born. The interviews were based on certain questions and revealed some interesting facts about his life. Finally the word should be given to Grigori Efimovich Rasputin himself. He wrote several books small in stature but important in content. His words were also preserved in his interviews with reporters. Sometimes even a few words said by him can give a better understanding of his personality than numerous pages fabricated against him. That is the reason our book contains small extracts from his works. A large number of documents and sources used in this book should not intimidate the readers. This is the only way to get through all the lies and libel covering the real life of Rasputin. We do not claim to have revealed all the mysteries of Grigori Rasputin�s life. Many things are still not clear and require special research. One thing we can definitely say today is that the myths about Rasputin created by the anti-Russian powers are not true to his actual life.